If you’re still on the fence about whether getting your child a keyboard is a good idea, consider some of the great benefits. Getting a keyboard for your child is one of the most cost-effective investments you can make for their early education. Increase IQ scores. 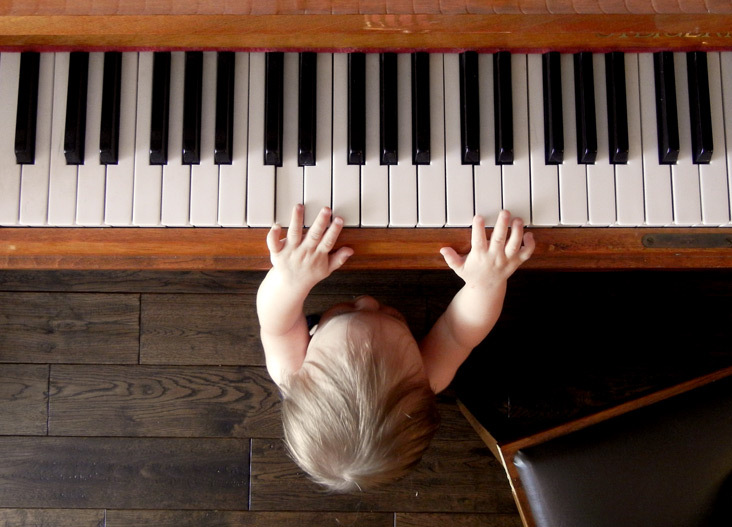 Studies have shown that piano lessons have a strong effect on a child’s IQ score. 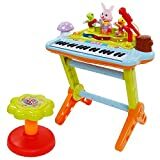 The skills learned in playing the keyboard carry over to other areas of development like mathematics, coordination, and spatial intelligence. It boosts self-esteem in your child. Learning to play the piano helps your child use feedback to better themselves and understand that they’re always capable of growing and learning from others. This will give them the self-confidence to tackle more challenging problems in life. It increases social skills. A study of over 200 children found that learning to play an instrument helped a child with several important life and social skills including anxiety management and emotional control. As you can see, the potential benefits are vast. 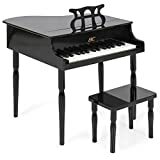 We’ve picked out some very affordable pianos for kids that will be sure to get you the best bang for your buck. Number of keys. There’s no real need to go above 61 keys, and for younger kids it’s the fewer the better. Sound source. Many pianos designed for very young kids actually use tuned bars, like a xylophone, rather than strings like a real piano. This makes life easier for you as there’s no maintenance or tuning needed. Other options might be electronic, which could be great when you want to control the volume of the keyboard and is also maintenance-free. That’s why we recommend the four below choices. According to our research, it’s difficult to go wrong with any of them. Reliability, quality and most important for this age group – DURABILITY!!! These instruments are very solid and can withstand years of a child banging away at the keys. They also won’t require any setup or tuning which is perfect for this age group. 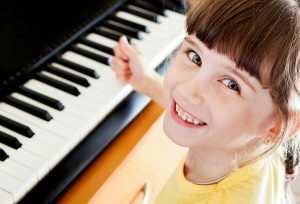 At this age range, your child is ready to take on music lessons and really develop an understanding of playing the keyboard. They don’t need to be overwhelmed though, so sticking with a smaller keyboard like this Casio SA-76 with 44 keys is a smart move. 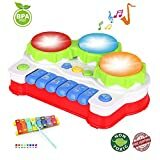 This keyboard has 100 different tones, 50 rhythms, and 10 songs to help keep your child interested and having fun. 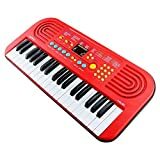 This keyboard is very portable and includes a headphone output in case you would like them to play without disturbing others. Finally, once your kid starts to hit this age group they’re ready for a more serious instrument. 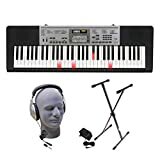 We recommend this Yamaha EZ-220 keyboard bundle which has everything they need to continue to learn and grow as a pianist. 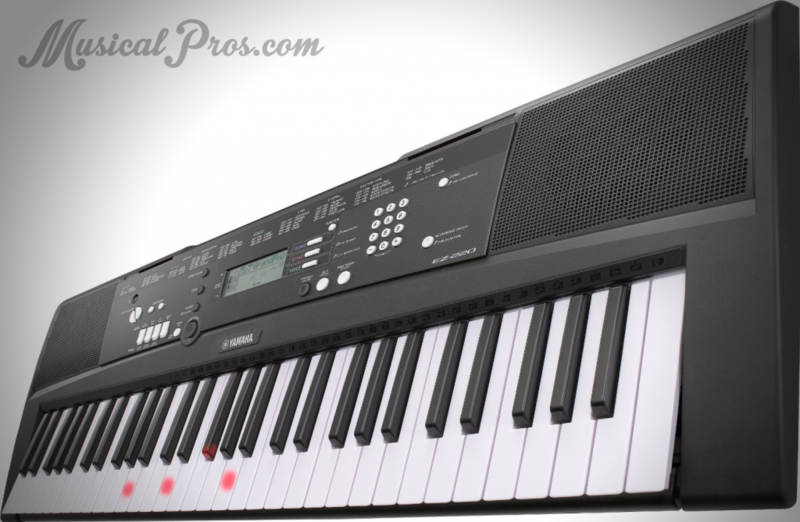 The 61 keys are touch sensitive and can light-up to teach your kid to play with 100 built-in songs. It also has a USB output mode to connect to a PC to use with learning software of your choice. 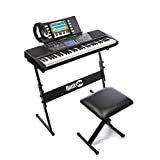 This Yamaha bundle comes with a stand, power cable, and headphones for silent practice. If you’re looking for a portable keyboard like this, you can find an extremely large and detailed guide over at Gearank that should answer any remaining questions you have. At this age, they usually have very firm musical tastes set in place, and there’s little you can do about it! Best to give them an instrument that can support different styles of play so they can explore and experiment with their own “groove”. One of the most crucial times in cementing a life-long love of music, it’s important to remain supportive and encouraging, despite what your own personal tastes may be! Whilst it is important to encourage children to practice and to learn discipline, routine and correct technique – please never forget that the number one priority is to foster a LOVE of playing, creating and sharing music. The number one cause of children giving up learning an instrument is that it “wasn’t fun anymore”. So live, laugh and encourage playing for joy itself.